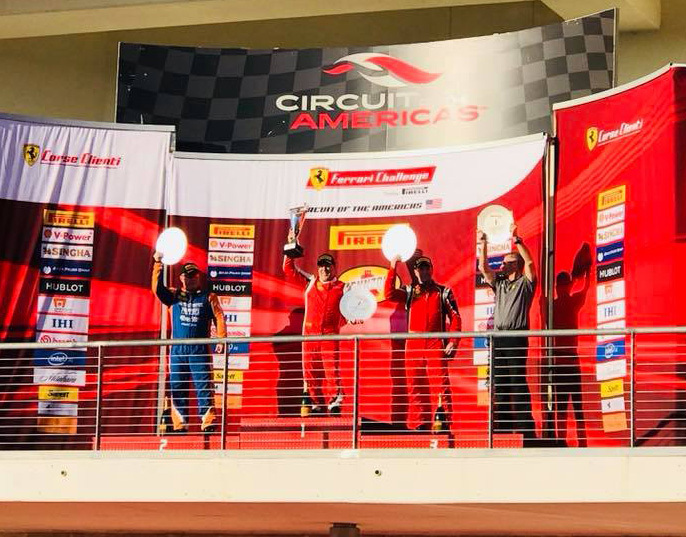 The largest ever field for Ferrari Challenge in North America arrived to the capitol of Texas when sixty-four 488 Challenge and 458 Challenge EVO race cars descended on the Circuit of the Americas. The occasion was of course Ferrari Racing Days, and while drivers reveled in the added excitement, the racing action of Ferrari Challenge took center stage. Dave Musial took second place on the podium for the Trofeo Pirelli Race in only his second race in this class since being moved up to the new division. Attrition in the Trofeo Pirelli AM class was significant, with four cars retiring due to incidents of one sort or another. But Dave’s quick thinking and reflexes allowed him to avoid a number of crashes and bring home another win! Congratulations to Dave and his team at Lake Forest Sports Cars and Fall Line Motorsports for their continued success! A single-model championship series developed by Ferrari for clients who have a passion for racing, the Ferrari Challenge Trofeo Pirelli has thrilled drivers and fans alike since its inception in 1992. The Challenge is run in three divisions– Europe, Asia, and North America – and is an ideal platform for drivers who have a passion for racing.